Dr Mark Lorson, called Doc by teachers and students, is one of the most well-liked and classic teachers at Jonathan Alder. He teaches chemistry and physics with an infectious energy and is well liked by his students. Growing up, in the Lorson house, there was much focus on education in Mark Lorson’s life. Both his parents were teachers, and heavily influenced Lorson to work hard and get good grades in school. All throughout grade school, Doc had fun and enjoyed learning. In middle school, Mark had a shop class which he really enjoyed; in shop class, students worked with wood, saws, and other workshop tools. Doc loves teaching, and was greatly influenced by his parents and teachers. One of his teachers in particular put him on the path of teaching. His high school chemistry teacher, Mr. Schrader, had a very different teaching style. Mr. Schrader made his class into a competition. He would arrange the seats in his class based on the students test scores. The students with the better scores would sit up front, and the ones with the lower tests scores sat more towards the back. Every time his classes took a test, the seats would change. Doc thought that this was a very interesting way of teaching, but assured that he would never do it in his own classes. When Doc was asked about what he most liked about teaching, he immediately replied that his favorite part of teaching was watching people get excited. He firmly believes that education is very important, and that people should never stop learning. To Doc, education is one of the most important things in life, on top of that, learning is important and should never be taken for granted. He really enjoys his job, and said that he would not want any other. One thing that Mark believes about life is that people should, “just try to be nice to each other.” Doc believes it is important to be nice to others. Not only that, but everyone, no matter who they are, could do with a little extra kindness in their life. Doc went on to say that hard work is important, and he wants his students to, “just try their best.” He stated that education requires work, and you will almost always get out what you put in to it. That is exactly the reason why hard work and effort are important. Doc has been teaching here at alder for a very long time, 37 years since fall of 1980. Even some current teachers were his students before graduating college and returning to Alder. Some such teachers are Mr Clark, Mrs Hall, Mr Glass, Mrs Seagraves and some others. One of Doc’s former students, Darren Clark, felt the same way. When asked what it is like to work with a former teacher, Darren Clark claimed that it is not that strange. “I had good relationships with all my teachers while I was still in high school. So once I returned from college, working with them was not weird at all,” Darren Clark described. Doc Lorson is an exceptionally good teacher. He starts each day with the same amount of energy and enthusiasm. He encourages education and excitement in learning. 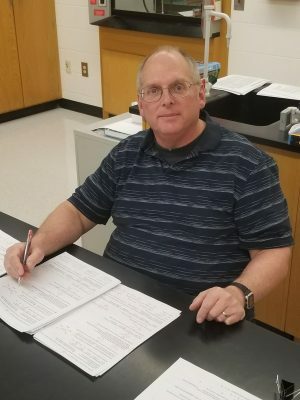 No matter if you are a student in one of Doc Lorson’s honors chemistry class, or a co worker, Mark Lorson is a very impactful person to be around.